COMMENTS: From Mr. Cutler's website: "I had always been interested in designing burr puzzles which are difficult to take apart. The burr shapes I had used to this point all had the same symmetry as the 6-piece burr or the 24-piece burr - mathematically there are 24 symmetries to these shapes. However, keeping all these symmetries and creating a new shape resulted in burrs with lots of Starting with the Wausau'81 burr, I experimented with shapes which had different 'patterns' of rods along the 3 axes. The last of the Wausau series. 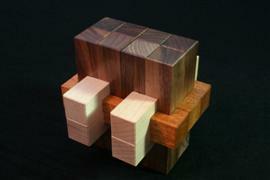 This puzzle requires several moves to get out the first piece."